There is really no need to own a poissonière or a turbotière to poach fish. They are great to use if you own them, but for most of us not worth the space they take on the kitchen shelf. Are they not beautiful though? The best thing about them is that there is a strainer fitted inside the pot that helps cook the fish evenly and of course, to drain it when it is cooked. So to poach our fish today, a filet of sockeye salmon, instead of these magnificent pots, I will use a large frying pan with a strainer at the bottom if possible, if the fish is not bigger than the strainer. So unless you had the sixth sense to put the above on your registry list, you will have to be careful during the process not to let the heat go high and not to break up the fish when it comes out of the broth. The broth is a vegetable broth, made fresh with carrot slices, onion, leek, celery, pepper corns, thyme, parsley, slices of lemon, salt, and 2 tbsp vinegar. Or you can use a fish broth from the store, or powder vegetable broth adding just vinegar. It should be strong, so boil it for a while if you make it from scratch. When it is ready and boiling hot, lower the fish in, and turn the heat down to medium. For a thin filet, bring back to a boil, then turn the heat off and wait 15 to 20 minutes, the fish should be done. For thicker cuts, simmer 5 to 10 minutes before turning off. It is impossible to give exact times as it depends on the fish. What matters is that the fish stays in the broth the longest time possible so that it absorbs the flavour, slow cooking it is. All fish should be served hot but “rare”, meaning the meat is no longer see-through but no more. Anything beyond, is overcooking and drying the fish. Variations: depending on the fish, the broth can be stronger and include white wine, fennel, garlic, dill, even capers with ray. Note: Poached fish is often served with a sauce in which case you may want to use some of the broth in the sauce. Or you can boil potatoes in the broth. This entry was posted in Main Course and tagged food, poach fish poached fish, poached salmon, poissoniere, recipe, recipes, turbotiere. Bookmark the permalink. Suzanne is right…the photo makes the salmon look like all I have to do is pick up a fork and stab the picture to have a delicious mouthful. You really do excellent food photography. 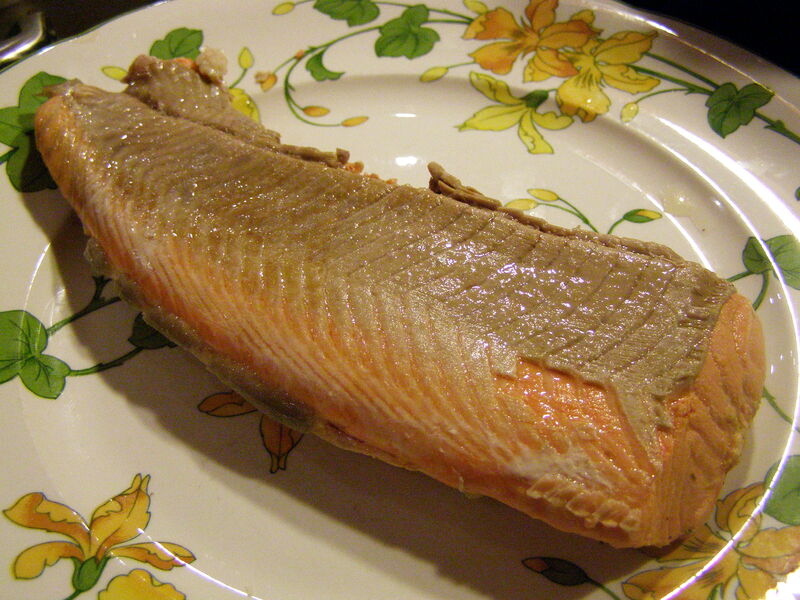 Of course, salmon is probably one of my favorite everyday meals. I love the stuff! Usually if the fish is not overcooked it will slide without breaking. I use a long spatula. For a whole fish, you can drain the broth and then use rubber gloves to transfer to the serving dish. Enjoy! the fish looks good enough to eat the picture….how is it possible to plate the poached fish without it breaking up? will it slide off the strainer easily?